Courtesy of Samsung Bosphorus Cross-Continental Swim Twitter account and an English translation by Hurriyet Daily News from the Istanbul Strait, Turkey. 2,472 people from 55 countries safely finished the Samsung Bosphorus Cross-Continental Swim (Samsung Boğazıçi Kitalararasi Yarislari or Samsung Boğaziçi Kıtalararası Yüzme Yarışı), a 6.5 km race across the Istanbul Strait where swimmers start by jumping off a ship in Kanlica on the Asian side of the Bosphorus and finish on docks in Kuruçesme on the European side of the Bosphorus. 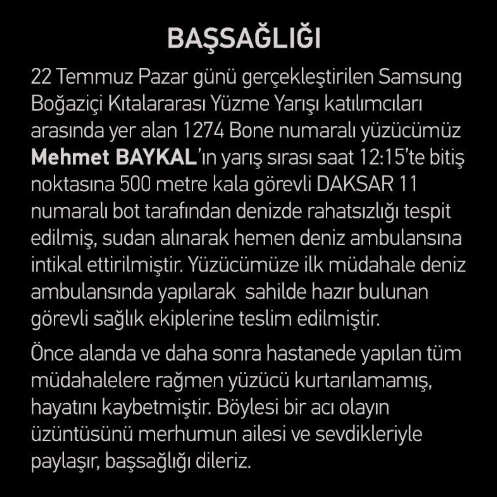 But Mehmet Baykal reportedly had problems 500 meters from the finish and eventually passed away. The organizing committee posted the following condolences in Turkish on its Twitter account: “He was pulled from the waters and taken into the sea ambulance. The swimmer received the first aid in the sea ambulance and he was transferred to the medical team on the shore. Despite all the treatments on the field and in the hospital, the swimmer could not be saved and he lost his life."